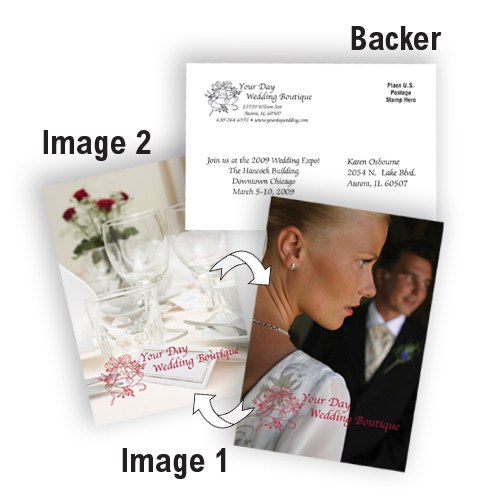 Custom Lenticular Mailer Post Cards Printed in Full Color in Bulk. On Sale, Inexpensive. 3 Different Sizes. Budget Prices in the USA and Canada. Wholesale advertising Lenticular Post Cards with Free Full Color (4 Color Process) imprint. The back of the postcard is laminated with lightweight white plastic sheet and printed with your artwork in black ink or in full color. 4" W x 6" Lowest cost in North America. We also supply blank Lenticular Post Cards at EQP (End Quantity Price). Free Artwork Design. American Clients pay no taxes. The unit prices below include you full color custom imprint. We also supply blank Lenticular Post Cards at EQP (End Quantity Price). • Lenticular imprint on front of card. • 4 color process imprint on back of card. • Material, Lenticular plastic, front of card. • Back of card printed: 1-4 color process ink.